Our children are not necessarily grateful to have been adopted. And we don't expect them to be. It is not that our kids don't notice the stability of a family. It's not that they don't cherish the love that they are receiving or that they don't like their new life. It is because children are programmed to need, want and expect love. When we provide it we are not heroes, we are simply meeting one of their very basic needs. Expecting adopted children to be grateful for being adopted is like expecting our biological children to be grateful for being conceived. It was a choice that we, their parents, made and that they were brought into. Please don't feed my kids. For children who have known hunger, food means love. We want them to learn to love us, their parents and siblings, before they bond with extended family, neighbors and friends. I know that they stare longingly at anything edible. I know that our two year old puts his head on the table and looks at you with puppy dog eyes. But since we were not there to meet their early needs (breast or bottle feeding, comforting them when they were sick, changing diapers, kissing boo boos) we need to make up for it by meeting as many of their physical and emotional needs as possible now. Many adopted children also have food insecurities. Some eat until they vomit and then start eating again. Others hoard food, needing the comfort of knowing that there is some saved for later. It is best to leave all feeding to the parents unless specifically directed otherwise. Parenting an adopted child is hard work and we struggle. We may tell you that were okay when we're really falling apart. We're worried that if we are honest about how difficult it is that you won't understand and that you'll think we're nuts. Adding a child who may or may not have anything in common with us socially, culturally, biologically or even personality-wise is challenging. Though undoubtedly beautiful and worth all of the struggles, adoption certainly isn't always easy or pretty. It is greatly appreciated if you choose your wording carefully, especially around our children. Yes, these are all our "real" kids (though sometimes it would be nice if all of my kids, adopted and biological, had "off" switches) and, in most situations, you probably do not need to specify whether you are talking about my "adopted kids" or my "biological kids". They are all my kids even if they joined us through different paths. If you'd like to offer support (meal, help with house cleaning, etc) when an adopted child joins the family, please do even if we don't reach out and ask. Many of us won't specifically ask for help or tell you what we need. However, I don't know a single adoptive mom who would turn down an offer to have a group of friends tidy/clean her house during those first few weeks at home with a new child. Likewise, coffee and chocolate are most always welcome and might be exactly what a new adoptive mom needs to get through those challenging times of adjustment! Please don't try to get our child to like you the most. Attachment and bonding are challenging enough without having friends and family slip our children candy, shower them with gifts, offer seconds at meals or encouraging bending and stretching of family rules. We're already working our tails off to get them to like us. With consistency and time they will learn to like you too, I promise. Our adopted children had lives before they joined our family. They had/have birth families and other relatives who are important to them and who deserve recognition and credit too. They have had life experiences that, while sometimes different than ours, are still special and valuable. Be considerate of the types of questions that you ask about our child's background and personal history, especially in their presence and especially if they are old enough to understand. Would it offend you if someone asked if you have AIDS, if you were abandoned, if your parents were drug users or how your parents died? If so, best not to ask these questions to someone else. We understand that it is normal to be curious and to wonder about the circumstances that led to a child's adoption. However, these are things that we discuss openly in our immediate family but not elsewhere. Our children may or may not choose to divulge more of their personal stories someday when they are older but they are THEIR stories and details to share, not mine. Sometimes adopted children need to be parented differently than biological children. We are not spoiling them. We aren't making excuses for poor behavior. Rather, we are parenting a child whose background may be very dissimilar to anything we've experienced. A child who has been abandoned and who has a fear of abandonment shouldn't be sent to time out alone in another room. A child who is still attaching to their adoptive family may need to be firmly held while having loving, affirming words whispered into their ear during a full-blown tantrum. The types of consequences that work for other children might not work for a child who doesn't have the same sense of value of their possessions and who doesn't understand what it means to have privileges. As parents, we must be flexible to help meet the individual needs of our child even if it means that we do things a little differently sometimes. If you would like to give a gift to our new child, please consider something small that the whole family can enjoy together. A few ideas are a frozen meal, a gift card to the movies, a small ornament commemorating the adoption or art supplies for all of the kids to share. We know that you want to welcome our new additions but gifts can be overwhelming for children who have had few material possessions. Also, we want our children to learn to love you for who you are, not for the fact that they hope they'll get another gift the next time they see you again. Other siblings may also experience jealousy and resentment if the new addition suddenly receives an armory of gifts and they are excluded. Attachment takes time and work. It doesn't happen overnight. Even if it appears that our child is securely attached to us it may take many months or years and every child and every family bonds differently. Many times we're faking it until we make it but one day we will wake up and realize that we're not faking it anymore and that our love is deep and real. Parents who have recently added a child through adoption need support, friendship, love and encouragement. Even if we're somewhat withdrawn and spending a lot of time at home cocooning with our new addition we value our friendships. Please continue to check up on us and to email, text, call or stop by. If you were in our life before we still want you in our life and in the lives of our children! Please refrain from commenting on our child's appearance (specifically relating to ethnicity/race) in front of him or her. All children want to feel included and to fit in. Pointing out how dark they are, how differently they look from the rest of us or how unique their hair feels only makes them feel like they stand out more. Please do not ask adopted children if they like their new parents/family. Adopted children do not usually get to hand pick their family. Adoption is similar to an arranged marriage and unique, sometimes very different people are brought together. With hard work and patience true love may grow. However, ask ANY child, biological or adopted (especially any older child!) if they like their parents and be prepared for some interesting answers! It takes time to help children start to heal from a difficult past. Just because they have been with us for a certain amount of time does not mean that the are "fixed". On the other hand, just because children are adopted does not necessarily mean that they will be any more difficult, defiant, less successful or anything else as teenagers or adults. 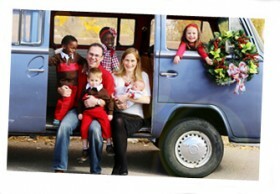 Educating your children about adoption and diversity helps my children. Talking openly about adoption, children who look different than one or both parents and other "nontraditional" family structures helps our children feel accepted and secure at extracurricular activities, church, school and elsewhere in our community. Our new additions are not celebrities. We appreciate all of the love and support that we were shown during our adoption process and we know that everyone is excited to meet them. However, taking photos of just our adopted child or pouring attention on them while ignoring our other children is not healthy for anyone. The child who is receiving all of the attention often feels singled out and siblings quickly become resentful. Our children may be "delayed" when they join our family but often they just need time. Adopted children are placed into environments that may be very different than anything they've ever experienced. They may be overstimulated, confused and sometimes there are language barriers. With time and patience most emotional, intellectual and physical delays will be overcome. Please do not tell us how amazing we (parents) are because we have chosen to adopt. We know that this comment is usually intended as a compliment but our adopted kids are not burdens, charity cases or a community service project to be completed. As parents we gladly invest the time and energy needed to ensure the happiness and well-being of any of our children. We may discourage physical contact with our child for the first several months that they are home or until we feel like they are securely attached to us. Please do not insist on holding them, hugging them or having them sit on your lap. Many children who have lived in orphanages and institutions learn to fight for adult attention. Often they can put on quite the show and act like the most friendly, charming child to draw attention to themselves. While it may be cute and though it gives the false impression that they are well-adjusted and confident, it is very important that initially the parents are the only adults who help fulfill these children's need for physical affection. This also teaches healthy boundaries and is a safety consideration since no child, adopted or biological, should feel obligated to have close physical contact with someone that they do not know well. We do not advertise our child's "cost". If you would like to know how expensive our adoption process was, please ask when our children are not present, call after our kids are in bed or send us an email. Most adoptive families are happy to share our experiences and to provide helpful information but we do not ever want our children to feel like they were bought or that they are commodities. When the going gets tough please do not ask if we regret our decision to adopt or imply that "we asked for it". Few people would tell a sleep-deprived mother of a colicky newborn "well, you asked for this" and it would be considered rude to ask a new mother if she regretted her decision to have a baby. Just because something is difficult does not mean that we regret it. There are bumps in the road of every journey. Even the happiest of adoptions are a result of challenging or difficult circumstances. Though we like to think of adoption as a "happy ending", birth parents may have made difficult decisions, children may have faced losses and many lives were forever changed. Though most adopted children grow to be happy, well-adjusted adults and though most adoptive families are beautiful and full of love, it is important not to romanticize adoption. If you slip and call our biological kids our "real" kids or if you've already asked "What happened to his mother?" we won't hold a grudge. We know that our family is different. We understand that it is impossible to be sensitive and politically correct in every situation all the time. These are ideas and suggestions, not commandments. We appreciate that you care about our family. We cannot thank you enough for wanting to learn more about supporting and understanding the adoptive family and for helping make this transition as smooth as possible for all of us!